Rainer is Professor of Modern European History at the University of Essex and the programmer of the University of Essex’s annual Holocaust Memorial Week. In his first blog, Rainer provides some context and a brief overview. The Nazi persecution of the Roma has long been a ‘forgotten’, or rather overlooked and unacknowledged, part of the Third Reich’s genocidal policy, and to some extent it remains so today. Few people are aware that the Roma were systematically marginalised and persecuted, deported to concentration camps, abused in ‘medical’ experiments, and shot or mass murdered by other means because they were regarded as ‘racially inferior’. Roma had been the subject of discrimination, persecution and enslavement for centuries, stigmatised as habitual criminals, vagrants, spies, asocial and workshy. In contrast to Jews, Roma did not experience full emancipation in the 19th and early 20th centuries through the abolition of all discriminatory laws and recognition as equals to other citizens. Instead, anti-Roma legislation remained in force across Europe, or was even newly introduced. In many places, activities of the Roma community were monitored by the police under the pretext of fighting crime, and attempts continued to ‘civilise’ them by forcing them to give up their travelling life. When the Nazis came to power in Germany, they made use of the existing institutionalised racism and the system of state control and surveillance, switching the rhetoric from fighting crime to targeting a whole ethnic community on the explicit basis of race. After Hitler’s appointment to Chancellor of Germany in January 1933, Roma were gradually deprived of more and more of their civil rights. 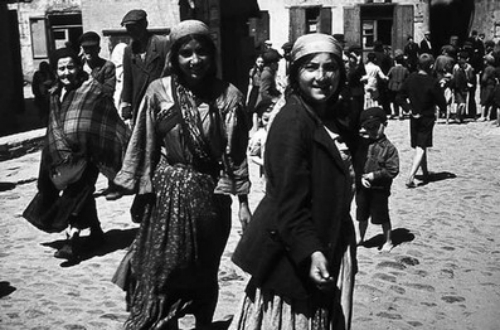 They were excluded from professional and trade organisations and, under the Law for the Prevention of Offspring with Hereditary Defects of 14 July 1933, Roma women were sterilised against their will. In the run-up to the 1936 Olympics in Berlin, so-called ‘homeless’ Roma were rounded up and forcibly taken to internment camps on the outskirts of towns. One of the most infamous of these Roma camps was Marzahn Rastplatz, set up in eastern Berlin between a cemetery and a sewage dump. In the same year, the German Department of Health set up the Racial Hygiene and Demographic Biology Research Unit, which was tasked with studying the ‘Gypsy question’ and concluded that most Roma were a ‘danger to Aryan racial purity’. On 8 December 1938, Reichsführer SS Heinrich Himmler issued his decree on ‘Combating the Gypsy Plague’ in which he propagated addressing the ‘resolution of the Gypsy question’ on the basis ‘of its essentially racial nature’. The outbreak of war brought further restrictions for the Roma, and on 16 December 1942, Himmler ordered the deportation of all ‘Gypsy, half-breeds, Rom Gypsies and members of Gypsy tribes of Balkan origin with non-German blood’ to a concentration camp. An order of the SS Reich Security Main Office of 20 January 1943 specified that they were to be deported ‘to the concentration camp (Gypsy camp) Auschwitz’. Roma were persecuted all across Nazi-occupied Europe and by states allied with Nazi Germany, and the Nazi government was happy to leave it up to the various regimes to deal with ‘their’ Roma populations. It is notoriously difficult to estimate how many Roma were murdered during the Holocaust, and numbers vary wildly. The evidence available today points to a total number of around 250,000 people. However, the exact figure will never be known; compared to Jewish victims of the Holocaust, there is a higher proportion of Roma who were victims of unrecorded killings, especially in the Balkans and the former Soviet Union.